I hadn’t come to Amsterdam for the food. Although I meant to sample regional dishes—mainly Dutch apple pie and pancakes—what I’d really come for was the art, the seventeenth-century houses, and the canals. I‘d reserved a place on a food tour that would take place the day before I left. 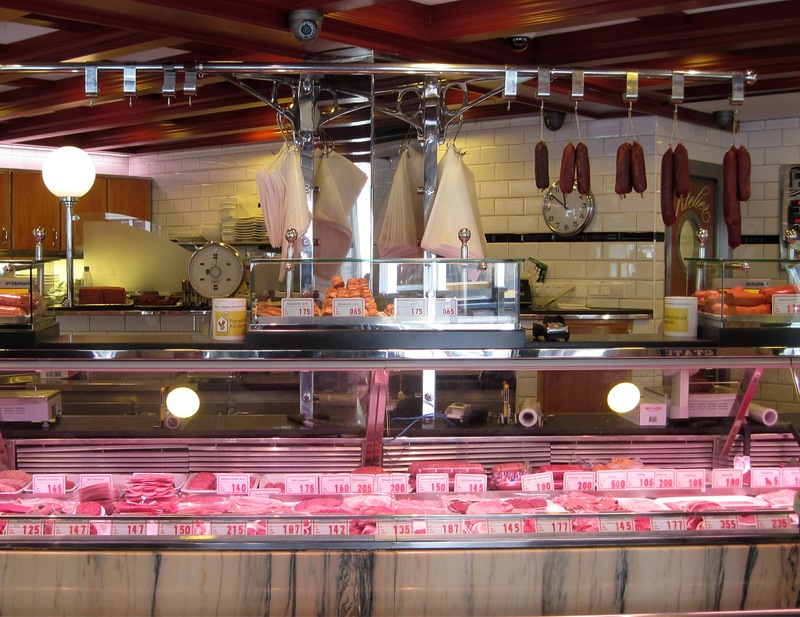 It was later in my stay than I had hoped, but in the end, the very timing of my culinary excursion would reveal, as never before, the role that food tours can play in finding intimacy with a city—and, in this case, a city I hadn’t initially liked that much. 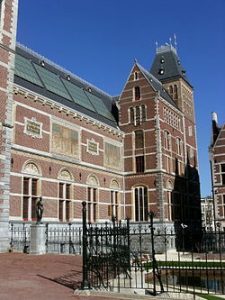 I’d read a book on Amsterdam’s history, one on sixteenth- and seventeenth-century Dutch painting, and another entitled Rembrandt’s Eyes¸ and I’d arrived expecting to see a treasure load of work by Rembrandt and Vermeer. During my visit to the Rijksmuseum, however, it became apparent that many of their most famous paintings resided somewhere else. 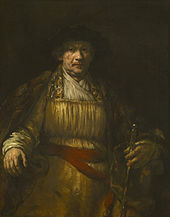 I googled a list of Rembrandt’s paintings and was astonished to find that out of 324 canvases (Rembrandt was a very industrious man) only twenty-two or so were to be found in Amsterdam. The rest of the 322 were scattered from Russia to Australia. Had the Dutch, a people known for their prominence in world trade, sold Rembrandts, along with pepper and pearls, on the global market? I’d also looked forward to being charmed by the seventeenth-century houses, and I was, at least by their silhouettes. Squeezed together like herring—one was only eight feet wide—most had peaked or curlicued roofs with hooks on the front for hauling up furniture. They were delightful in outline, but the brownish red of their exteriors struck me as somewhat dreary. 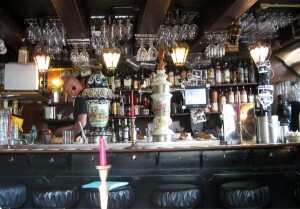 Amsterdam as a whole, indeed, seemed full of somber colors—grays, darkened ochers, browns, and brownish reds. Were they an expression of the city’s historical devotion to business and, in the seventeenth-century, to a Calvinist ethic requiring modesty? Wealthy male citizens, after all, appear in seventeenth-century paintings dressed in black. Had Rembrandt, in his preference for browns and ochers and a splash of red, redone the colors of Amsterdam so as to render them mysterious, gleaming with bits of light, soulful rather than industrious? 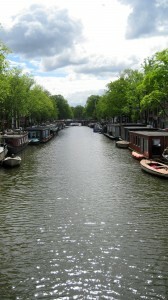 The canals had their loveliness—spring trees had leaved in tender shades of green. And in time I saw that changing skies gave them different moods—cheerful in the sun, reflective, harboring unspoken depths when the sky was over cast. 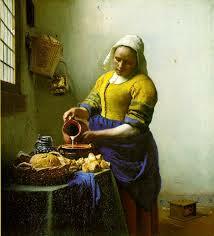 No wonder Rembrandt worked so much with light. But my attempts to get in tune with the changing moods of the canals were continually disrupted by whizzing bicyclists—perhaps on their way to work? — who always seemed to have the right of way. It’s hard to cozy up to a city in which one false step so often put one’s arms and legs, not to mention more tender body parts, in danger. 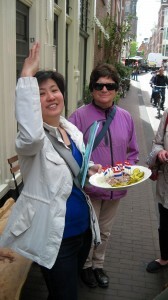 It was the food tour that opened the door to bonding with Amsterdam. Any four-hour small-group tour can give you a feeling of intimacy with fellow travelers, but eating together, three times at tables, and four hanging outside on a cobbled street, deepened my sense of connection because it evoked the thousands of times I’d cozily shared food with people I actually knew. Our Afghan taxi driver had warned us that the Dutch were “cold,” but our tour guides were warm and inviting. They had to be, of course. That’s how they earned their living, but the effect, nonetheless, was of being taken in by natives. The intimacies generated by the tour made me feel closer to Amsterdam. Our guides, indeed, felt less like guides than hosts throwing an ambulatory dinner, and although the joke in Amsterdam is that the Dutch are so careful with their money that when they serve coffee to their guests at home, they give them only one cookie, provisions on the tour were bounteous. The bounty of the tour made Amsterdam itself seem more generous in its delights. And in the process of eating, I also learned a lot about the city’s psyche. From one perspective, it was married to business, from another, secretly engaged to indulgence. We began our tour, for example, with Dutch apple pie at 10 a.m. The pie, really more of a cake, crunchy with sugared topping and smelling of cinnamon, was served with a large dollop of whipped cream. 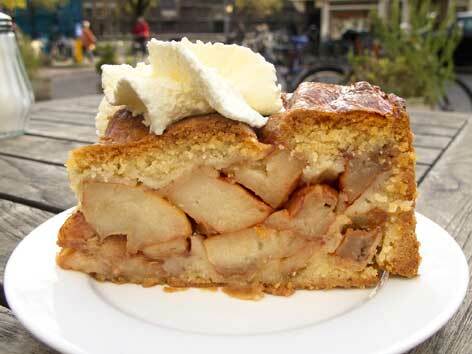 The Dutch, we learned, frequently ate this confection for breakfast. Dessert for breakfast, hmm. Next we visited a take-out place and sampled broodje pom, a dish from Suriname, a former Dutch colony, involving sautéed chicken, a grated native plant, and a sauce of onions, tomatoes, and nutmeg spread on a piece of bread. Also fried plantain with rich peanut sauce. 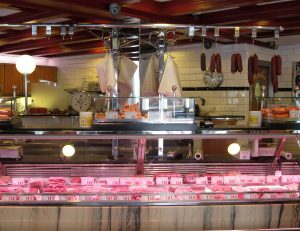 Then, onto the butcher for sasauge with spicy mustard, to the fishmonger for fragrant deep fried bits of cod, and to the candy store for tangy licorice. The licorice store was run by a large, laughing woman with bright red hair. 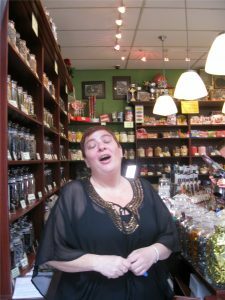 Licorice, she told us, is the candy most favored by the Dutch who eat an astounding four and a half pounds per capita a year. They buy bags of it, she said, to stash in their cars and kitchens for all day snacking. Licorice is an acquired taste, especially when heavily salted—I had to spit mine out—and, not surprisingly, it has been used in the past for medicinal purposes—the treatment of coughs, liver disease, and peptic ulcers. It is also fifty percent sweeter than sugar. This blend of the officially practical with the privately indulgent was beginning to seem deeply ingrained in the city’s psychology. “I’ve come for my medicine,” one customer joked. The most indulgent moment of our day came on our canal ride, the group gathered closely around a table in an elegantly-turned-out boat, full of dark wood, red cushioned seating, red velvety drapes, and tiffany lighting. As we slid, without care—without bicycles!—along the glimmering canals, we drank Prosecco with three kinds of Gouda cheese and Dutch beer with prosecco and deep fried croquettes of ground veal and potato, ending the day with small, puffy pancakes covered in powdered sugar. Yum. Our trip had led us into Amsterdam’s sensuous interior, into its penchant for indulgence—when it wasn’t dashing off to work. 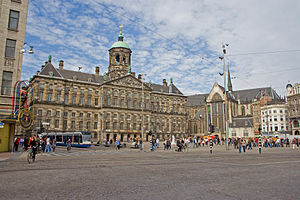 Our journey had also taken us into Dutch interiors of the physical kind, where browns and dusky reds, so dreary on the outside of buildings, became welcoming, offered refuge from the bustling world of business just outside. 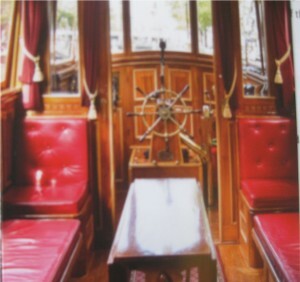 There was the lush interior of the boat, and we had started and ended the day in two of Amsterdam’s “brown cafes,” known for their dark wood and smoke-stained walls and for being gezellig, which means something like cozy. Vermeer’s’ paintings of domestic interiors, most often pristine, filled with light, and peopled by women, also capture a sense of refuge from the rumble of public life. 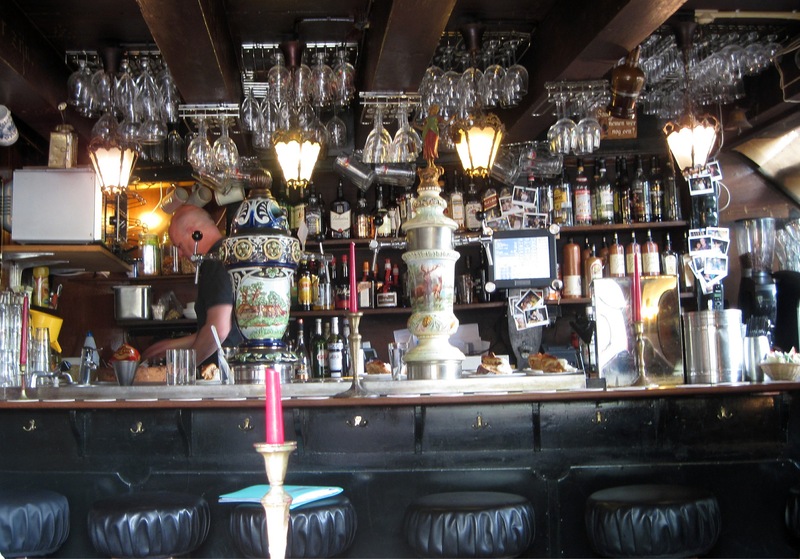 But the interiors of the brown cafes were originally male spaces, the kind of cozy settings Rembrandt himself frequented, when he wasn’t furiously painting and marketing his wares. Now open to all genders, they were one of the snug interiors behind Amsterdam’s sometimes sober public face, and it was the food tour, however momentarily, that had made us part of them. Great post. 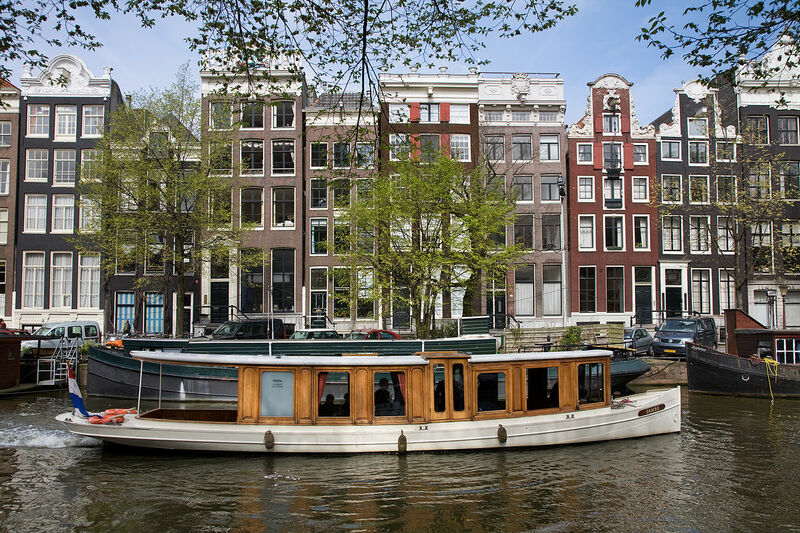 A unique take on Amsterdam, one most of us wouldn’t have thought to experience. I love how you combine the external physical structures with what is inside. Regarding the dark colors in the 17th c, so overwhelming was the need for black in the 1600s that, according to Van Gogh, Frans Hals developed twenty-seven shades of black. Hals used the black clothes and tan and grey background to highlight the sitters’ faces. Thank you, Mardi. Good to know about the shades of black.